WiCis-Sports has taken telemedical monitoring to a giant step forward by allowing adventure enthusiasts in very remote places to share in real time their vital signs and geo-location data to any internet connected device in the planet with only a 2-4 second delay. This new technology will allow for the safer practice of any activity from any distant or isolated location and opens up telemedicine to anywhere. 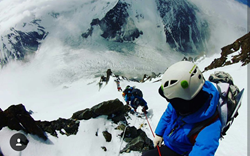 The #K2Adventure16 project began on 12 June and is set to reach the summit in mid-August. Led by Garrett Madison, the team of ten is accompanied by porters from Pakistan and Sherpas from Nepal. One of the most remote places on Earth, with only 46 permits issued in 2016, K2 is the second highest and arguably the world’s most intimidating mountain. Select adventurers will wear bluetooth-enabled wearables as part of their normal climbing gear. The sensors continuously monitor heart rate, oxygen saturation, skin temperature, geo-location, altitude, speed and bearing. Remote monitoring will reduce costs for adventure climbers who do not have a doctor at base camp, and will allow more expeditions access to remote medical support in real time. WiCisSports is also combining and analyzing vital sign data to provide a snapshot of the climbers overall health status. Should a medical or other emergency arise, rescue teams will have immediate access to the data needed to assess the climbers’ condition and the exact location. Two successful trial expeditions were undertaken earlier this year in the Himalayas. 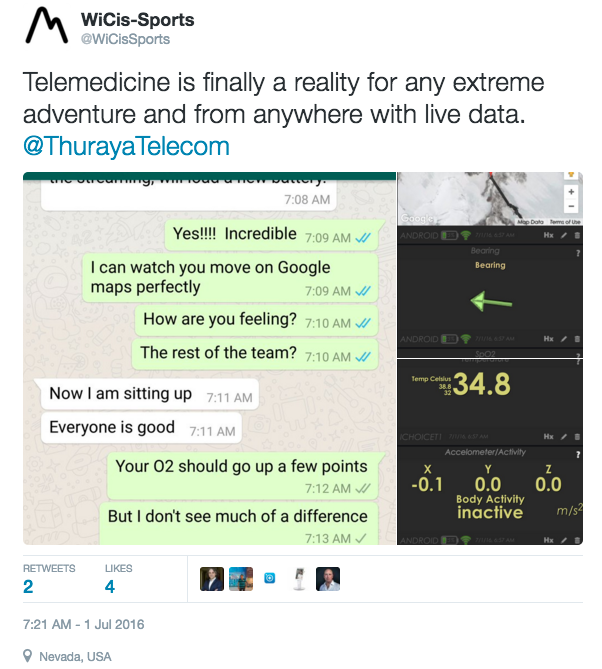 Montejo, a team leader in the first of the two, tested the Thuraya SatSleeve+ and WiCis-Sports App. Montejo said: “The time we spent testing the equipment meant we could make improvements to the system. Thuraya SatSleeve+ is reliable and blends nicely with the WiCis-Sports App. The public dashboard carries real data in real time, including the GPS location, altitude and speed of the expedition team. It also monitors and displays oxygen, heart rate and body temperature information. Medical conditions such as edema, hypothermia and cardiac arrest can occur if climbers push themselves too hard and too far in the ultra-thin air. Any medical issues that do occur can be addressed immediately, with Dr. Montejo also conducting daily assessments of each member of the team’s data. This information can also serve as a record of recent health data, to help doctors decide on the best future treatment. OCENS is providing continuous pinpoint weather data and forecasts via their patented WeatherNet software. 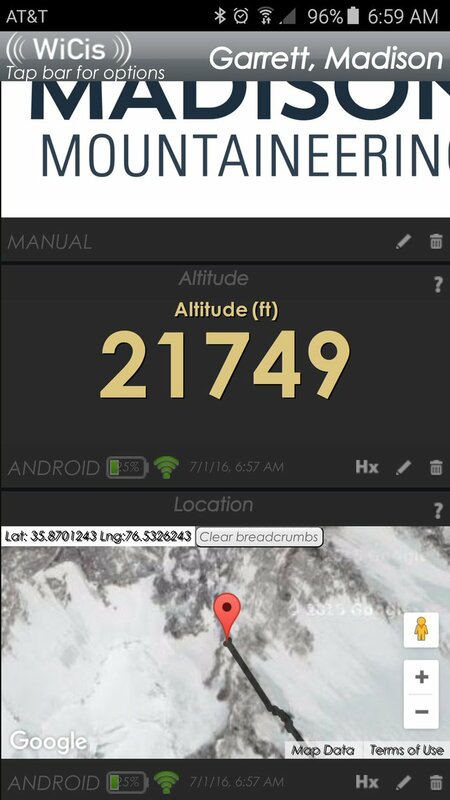 This information is displayed in real time on the WiCis-Sports dashboard and also on the WiCis-Sports Android App which the climbers will use. A range of wearable health monitoring devices was tested in the Himalayas, in March 2016. Two members of the team were designated on alternate days as test subjects and given trial equipment to wear. Lightweight, wearable sensors were attached to the body and a Bluetooth connection between the devices and the WiCis-Sports App was set up on a smartphone. The app gathered health data and allowed it to be transmitted in usable form over the internet. The smartphone was then connected to the Thuraya SatSleeve+ to establish a continuous data stream via satellite. With a lightweight back-up battery attached, the team found they could stream continuously from the Thuraya SatSleeve+ for eight hours a day without any problem, recharging batteries with portable solar panels. Thuraya Telecommunications Company is an industry leading MSS operator and a global telecommunication provider offering innovative communications solutions to a variety of sectors including energy, broadcast media, maritime, military and humanitarian NGO. Thuraya’s superior network enables clear communications and uninterrupted coverage across two thirds of the globe by satellite and across the whole planet through its unique GSM roaming capabilities. The company’s diverse range of technologically superior and highly reliable mobile satellite handsets and broadband devices provide ease of use, value, quality and efficiency. Founded in 2011 by Harvard and Stanford anesthesiologist Dr. Leo Montejo (also founder of Picis), and in the Lake Tahoe area, the company’s goal is to promote the use of mHealth and tracking devices to make adventure sports safer and engage their followers with real time data that is either private or also available to social medial platforms. Dr. Leo Montejo has been designated the expedition doctor for K2 using the WiCis-Sports solution as a telemedical tool. He did his residency at Harvard in anesthesiology and critical care medicine, has been a Professor at Stanford in this specialty, and is an extreme sports enthusiast. Dr. Montejo has participated in three Himalayan expeditions. At OCENS, we strive every day to separate our company from the fad and fancy of the satellite phone marketplace by reminding ourselves of the extreme realities our customers face. This abiding attitude is reflected in the software we develop, the products we sell and the commitment we make to after-sale support. Our patented “SpotCast Extreme Weather.” Weather service combines a transfer engine specifically configured for satellite phones with a library of classical and modeled weather and ocean data and an intuitive file management system. Madison Mountaineering is a boutique mountain guide service based in Seattle, Washington. It specializes in mountaineering expeditions to the “7 Summits” and other renowned international and domestic peaks, as well as unclimbed peaks in extremely remote regions. It provides education and training for climbers who aspire to become self-sufficient, aware and respectful of the local culture; stewards of the environment; and for whom safety is the number one priority in all climbing endeavors. Garrett Madison began guiding professionally in 1999 on Mount Rainier, and is now America’s premier Everest climber and guide. As Expedition Leader, he has personally lead 37 climbers to the summit of Everest over the last 7 years, more than any other American.